Last week, Michelle made a comment on my Robeks Juice Review, wondering how the new McCafe Smoothies with — gasp! — “real fruit” might compare to the more traditional smoothie shops out there. Considering that McDonald’s is a force to be reckoned with (good or bad), and that they’ve branched out into the popular smoothie market, it’s worth taking a look and seeing how they compare to other popular places. McCafe’s Strawberry Banana vs. Jamba’s Strawberries Wild vs. Robeks’ Strawnana Berry. The ingredients listings for all of these smoothies can be a little misleading. All of them have “yogurt,” which hides other ingredients. Turns out, even Jamba’s “Fruit Juice” has more than just fruit juice, too. Strawberry Banana Fruit Blend [Strawberry puree, banana puree, water, sugar, concentrated apple juice, contains less than 1% of the following: cellulose powder, natural (botanical source) and artificial flavors, xanthan gum, citric acid, colored with fruit and vegetable juice, pectin, ascorbic acid (preservative). ], Low Fat Yogurt [Cultured Grade A reduced fat milk, sugar, whey protein concentrate, fructose, corn starch, kosher gelatin. Contains active yogurt cultures. ], Ice. Apple-Strawberry Juice Blend, Nonfat Vanilla Frozen Yogurt, Frozen Strawberries, Frozen Bananas, Ice. When I was at Jamba, I asked if they had an ingredient list for the yogurt. They showed me the book with all the ingredient details — kept behind the counter — and I was able to view the ingredients in both the Frozen Yogurt and the Juice Blend. Sidenote: There was a big sign on the wall that proclaimed “No High Fructose Corn Syrup.” Apparently they prefer to add regular ol’ corn syrup instead. Apple Juice, Strawberries, Bananas, Non-Fat Yogurt, Ice. The verdict: Jamba and Robeks take the lead, since they use whole fruit that’s blended right in front of you — not in a factory. The largest McCafe size is 22 ounces, equivalent to Jamba’s “Original” size and is actually smaller than Robeks’ regular 24-ounce size. The McCafe pricing was better, too – though that’s not particularly surprising. McDonald’s sells 12, 16, and 22 ounce sizes. I paid $3.06 for the 16. Jamba comes in 16, 22, and 32 ounce sizes. $3.55 for the 16. Robeks offers 12 , 24, and 32 ounce sizes. $3.45 for the 12. The Verdict: McDonald’s, both for their lower prices and their more reasonable serving sizes. The McCafe smoothie was good, but at the same time the first words out of my mouth were: “Tastes fake.” The flavor seemed a little too perfect; larger-than-life, if you will. My significant other, eager to help with the taste-testing, described it as “super-strawberry,” and that it “tastes good, but in a heightened way.” Must be because of the artificial flavors they sneak into the fruit blend. The Jamba was a little creamier, and didn’t taste as “flavored.” I could barely taste the banana. It was slightly thicker than the McDonald’s smoothie. Robeks has the most banana flavor of the three. The apple juice came through as well. It also felt like there were more ice granules, so it was a little less creamy. They’re all quite similar, but I’d probably put Jamba at the top of the list. The McCafe was a little too synthetic, and I just enjoyed the Jamba more. Of course, since Jamba and Robeks are using fresh fruit, the taste may vary slightly from smoothie to smoothie. I’d expect that McDonald’s, with their “One world, one flavor” motto, would taste exactly the same every time. The Verdict: They were all delicious, but Jamba was my favorite. McDonald’s wins this one hands down: I used the drive through and there was no wait. Amazingly, by the time I pulled up to the window — maybe 20 seconds after I ordered, I saw them pouring my smoothie out of the blender and into the cup. Couldn’t have been faster or easier. The parking lots at both the Jamba and Robeks? Crowded nightmares. Since the sizing varies, I’m listing the numbers for the “medium” version of each, since I’m guessing that’s what most people will order. I’m also showing the quantity in 12-ounces of each. They’re all pretty darn close. On a per-ounce basis, Robeks stands out as the lower-sugar (and therefore lower-calorie) option, but it’s a marginal difference — and if you’re going to get their 24 ounce size, those extra 2 ounces will offset the difference anyway. What the numbers don’t tell us is the difference between “fruit blend” and whole fruit. I believe that throwing whole fruit in the blender, rather than using a pre-made fruit blend, is a more nutritious choice. The verdict: Robeks edges out Jamba, by a thin margin. Before starting this little smoothie-journey, I was expecting there to be more significant differences between the three smoothies. I’m inherently biased against McDonald’s (no surprise there, I’m sure), so I figured they’d come out dead-last. I also have mixed feelings about spending my money at McDonald’s. I’d rather not give them any of it, of course, but then again, by buying their healthiest options, that helps indicate that there is indeed a demand for them. Not quite sure how to reconcile that. Learning that Jamba uses flavorings in their fruit juice and yogurts was a big disappointment. It’s likely that Robeks does this as well, but I don’t yet know for sure. If you’re going to buy a smoothie, get a Jamba “All Fruit” smoothies, in a sixteen. Even if they add some flavoring to their fruit juice, you’ll skip the extra sugar from the yogurt (or sorbet, or sherbet). Better still would be to make your own smoothie at home. *In case you’re wondering about the photo: My kitchen needs cupholders. Let me explain. I picked up my McCafe smoothie on the drive home, cheerily bringing it into the kitchen with eager anticipation. I hadn’t even tasted it yet. I set it on the counter, and was preparing to take a photo, moving a few things out of the way. 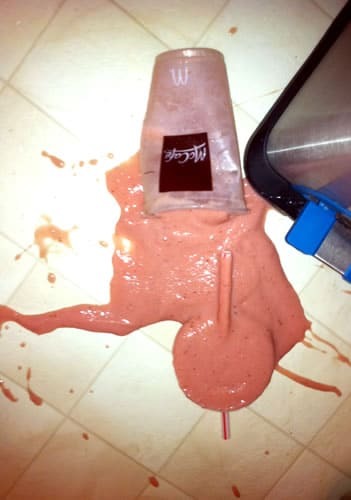 Clumsy oaf that I am, I bumped the smoothie and it hurtled to the floor, spraying pink strawberry-banana mist all over the kitchen (and me). Thankfully there was enough left in the cup to have a few sips. Let’s talk about something else now, thanks. Agree – you can also have Jamba omit the yogurt, though my favorite flavors at Jamba are the ones with sorbet blended in, so I have the sorbet replaced with yogurt, which is better, I guess. Not as good as the all fruit varieties, though. Definitely. It still breaks my heart a little that even the Jamba “fruit juice” has added flavors. I used to get these MAD cravings for Pomegranate Paradise all-fruit Jambas – they taste like Jolly Ranchers, seriously – but then I decided it was weird to spend money on someone else’s blender, so I’ve been making SO many smoothies this summer. Plus, I have to leave Portland for the suburbs to get one – we don’t have any in town! Put those cases of Pom Wonderful to good use! 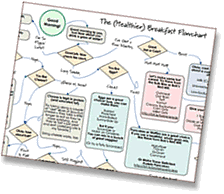 Btw, did you see my smoothie flowchart? Curious to know what ya think, since you’re a smoothie expert and all. Very cool article! Thank you very much. I guess my better half had it right all along with her quick breakfast smoothies at home.